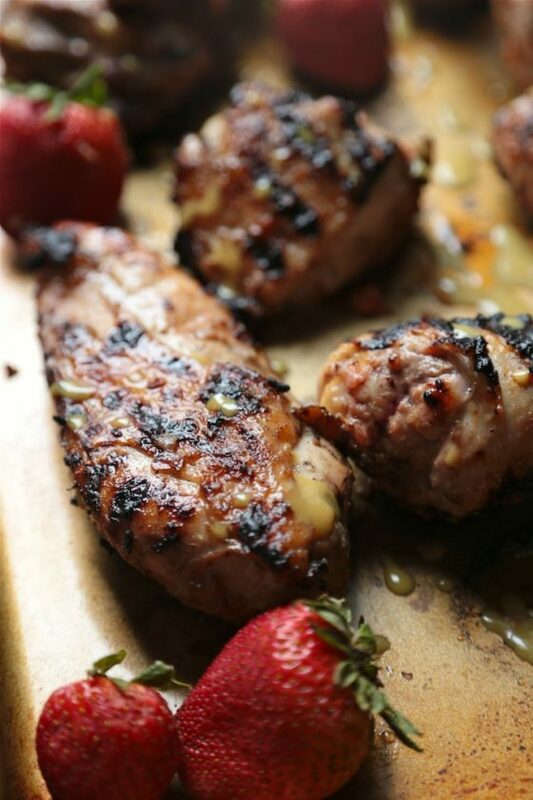 This strawberry honey mustard South Carolina Style BBQ sauce will put a fruity spin on this spit fire classic! 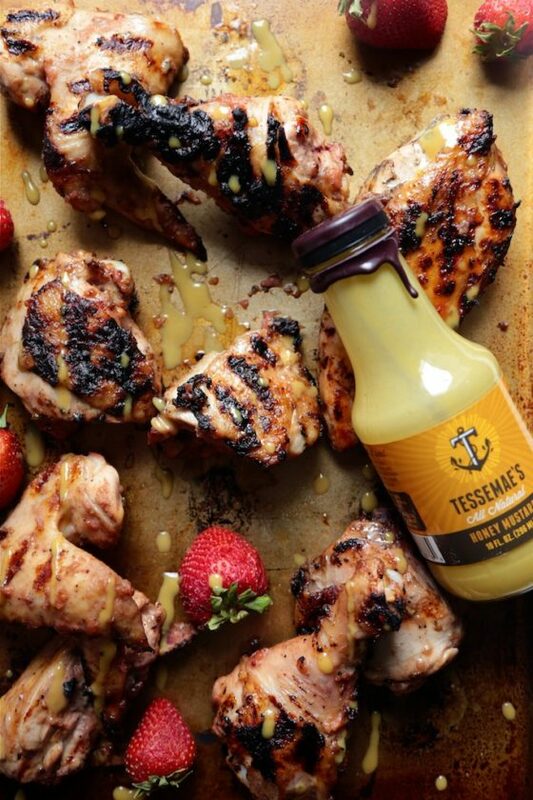 Using Tessemae’s olive oil based honey mustard, this sauce is sweet and tangy, perfect for summer grilling. The first thing Ben grilled for me when we started dating was a burger. Me? I swooned, a man that could grill! Except when it came to me on a bun, it looked more like a hockey puck than it did a juicy piece of meat between sliced carbs. It was crunchy, people! But I liked the guy, so I put on a good face and gnawed down the burger. It’s been nearly seven years now – and I did marry him – and thankfully his, and my grilling skills have expanded since then. Like, by leaps and bounds. We’ve both definitely expanded our repertoire to new things to grill, and since last weekend was Memorial Weekend – the unofficial start of summer – it was only appropriate we bust out the grill again and do it right. Most of the weekend Ben and I stayed home, we were both working – me cooking for the blog, cooking freezer meals for my best friend and her husband while they deal with a sad family event, and even fitting in a date night with Ben. Have you seen Pitch Perfect 2? If you haven’t yet, do it. I might even like it more than the first one, which I will admit I also saw just this weekend!! *ducks and covers* I KNOW! Totally tardy to the party! But by Monday, all of the deeds were done and we got to spend the weekend doing what normal people do – eating, and drinking a beer or two. This chicken also was a must. 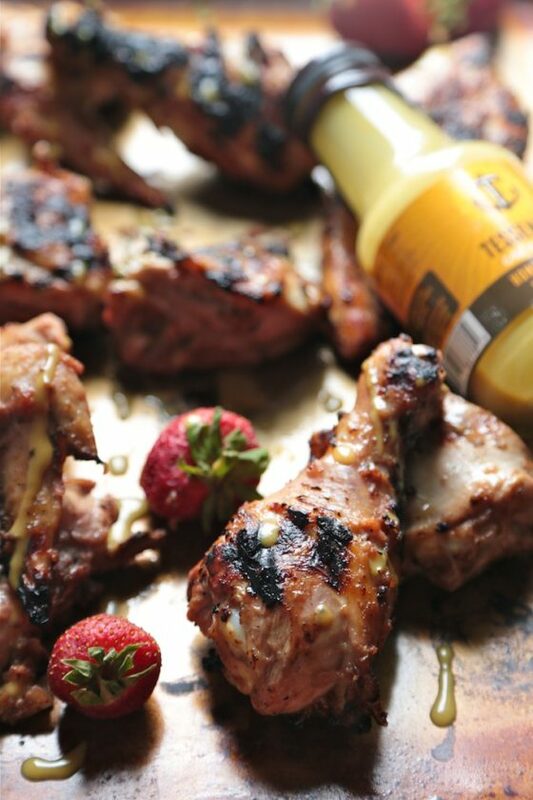 I opted for creating a riff on a BBQ sauce classic – the South Carolina mustard based BBQ sauce. 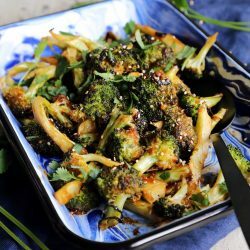 But with Tessemae’s honey mustard, I wanted to make sure this will sweet and super tangy, and it really was. Adding the strawberries gave this a fun subtle twist in flavor, and the chicken came out super juicy after locking it in from the flames. 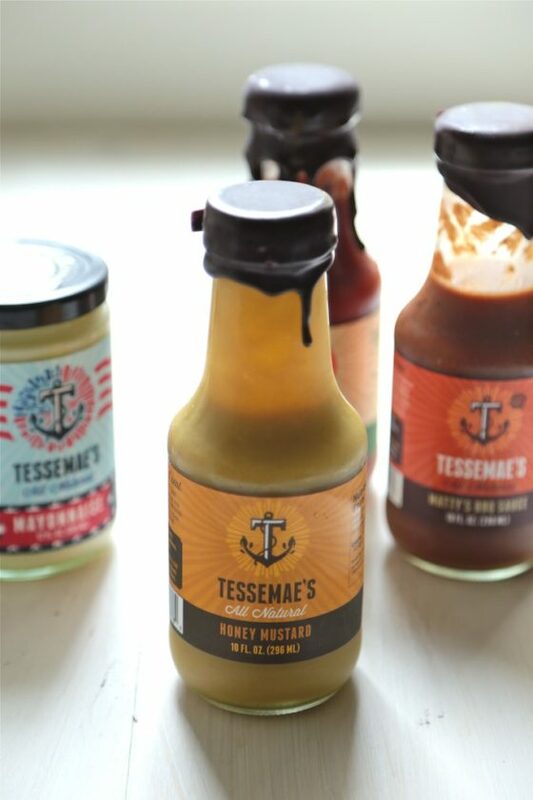 Tessemae’s condiments are all olive oil based, all natural, and pure yum. Make sure they are stored in the fridge to avoid spoiling! If you do find that they solidify in the fridge, Tessemae’s recommends just letting them warm up a tad on the counter. No worries! Learn more about Tessemae’s on their YouTube Channel. 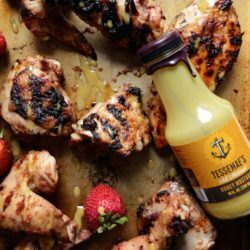 This sauce made the perfect marinade, and bbq sauce, so divvy it up and use it as both for maximum flavor wowwage. Sure beats a hockey puck charred burger – if I do say so myself! 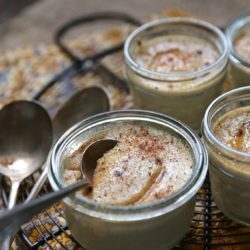 Want to try Tessemae’s? Use Code : TesseCleaver at their online store for a discount and stock up! In a large saute pan, melt butter until simmering. Add in onion and cook, stirring occasionally until translucent and just beginning to caramelize. Add in minced garlic and stir until fragrant. Once the garlic is fragrant, add in the balsamic vinegar, and stir. Add in brown sugar, Worcestershire sauce, chile sauce and then diced strawberries. Bring the mixture to a simmer and simmer about 10 minutes until thickened. When thickened, remove from heat and allow to chill in fridge before using as a marinade or sauce. When cool enough, pour the sauce from the saute pan into a food processor, and blend until nearly smooth. If there are a few bits and pieces and chunks, that is okay. Use as sauce or marinate. For grilled chicken - pour half of the sauce over an 8 piece cut chicken. 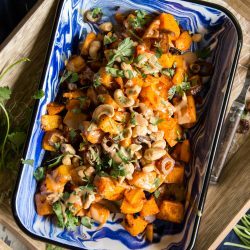 Allow to marinate for about 1-2 hours, or even over night. Save the second half of the sauce for the BBQ. Preheat the grill, to medium high heat. 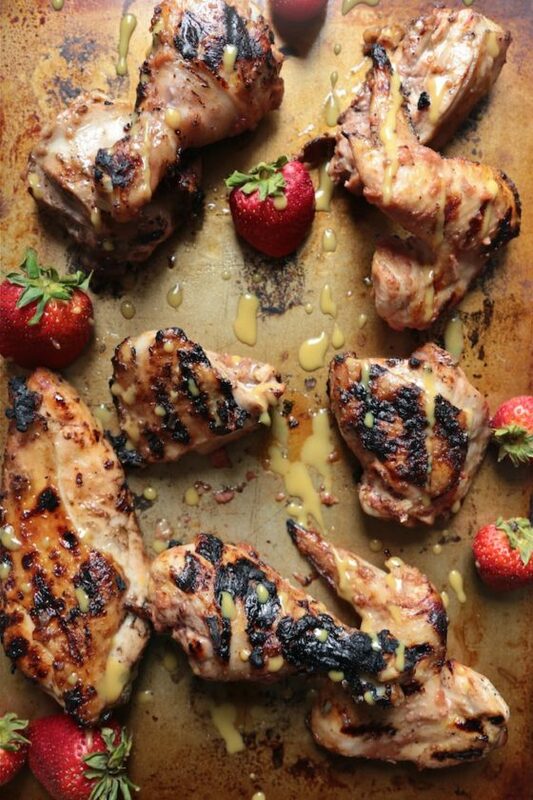 Place chicken on pre-heated grill and using a brush, baste the chicken with the remaining Strawberry BBQ Sauce. Allow the chicken to cook about 5 minutes per side, and only flip once to allow chicken to cook and char appropriately. Cook chicken until each piece is heated and cooked to proper temperature. Remove from the grill, and plate. Cover the plate with chicken with foil and allow the chicken to rest for about 5-7 minutes before digging in. *Fine Print* This recipe was sponsored by Tessemae’s. All opinions are my own. Hey, I haven’t seen that movie yet..so you’re good. I am definitely the last to be in the know about such things! Loving how healthy this honey mustard is, totally going to check it out! Pinned! I haven’t seen it either!! Will you come to Portland this weekend to watch it with me?!! Pa-lease? Oh, and bring some chicken too! Um, best bbq sauce EVER much!? I love this! This chicken looks awesome!! 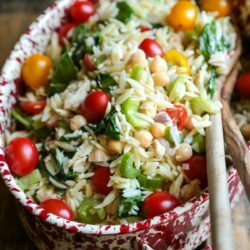 I am always looking for new grilling recipes and trying to get better at it as well. I think grilling does better if you watch it and not walk away only to come back to it in flames!! <–that happens to me all the time! I haven't seen either of those movies yet!! I need to find this brand – i’ve been looking for all natural BBQ sauces for my boys!! Craving this chicken something fierce. GORGEOUS Chicken! Totally hunting this brand down. Happy Friday!! I have had a few hockey puck charred burgers in my day…and this chicken looks WORLDS better than that! That bbq sauce is calling to me…such great flavor! 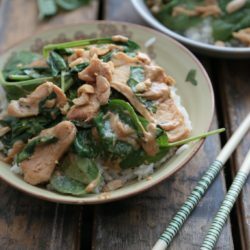 What a beautiful chicken recipe. I need to get my hands on those BBQ sauces!